in the news media world, covering diverse aspects of both print and digital. The conference is in its 26th edition this year, organising at HICC in Hyderabad, marking its return to the South India city after a gap of 14 years. When it comes to considering the conference’s focus on printed newspapers sector, some key highlights at World Printers Forum session this year will be on print media trends and distribution models. Speakers from leading media houses from India and overseas will take on vital topics like operational excellence, quality and process efficiency in newspaper production. After all, there will be sessions in which speakers look at what the industry holds for future of the news media companies. On other side of the conference, a handful of sessions at World Editors Forum South Asia Summit will shed spotlight on the growing trend of digital media. ‘Digital first approach’ will be one of the key topics of discussion in the summit. It’s doubtless to say that the ‘digital’ has changed the news media landscape. As a concern and analysis of this new revolution in the industry, there will be sessions on digital journalism and change management, in which a host of speakers from India and abroad will talk about the way the industry is changing and approaching to cope with the change. Big data and reader engagement will also be the areas where the discussions are revolving round. An all-time good factor of WAN-IFRA India Conference is that its edition is a learning platform for everyone taking part in it. The conference is the right networking point to connect with right people from the industry. Every year, the conference brings insights of new technologies and innovations from leading newspaper houses, machine and technology manufacturers, supply chains that transform the media industry. Media houses from India and abroad in every edition present case studies and best practices that can relate to new development. The same is going to happen this year too at the Hyderabad conference, for sure. Be there and catch the new trends of the news media industry! In this issue, we do facelift the overall outlook of the magazine. As we have given the magazine a brand new look and a complete makeover, our masthead has also undergone a subtle and significant update. 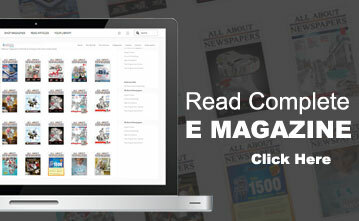 Now the magazine appears in a big and bold way, with richer design and images. Hope you like our new outlook. After all, what isn’t changing is our commitment to deep and definitive coverage of the industry with unique features and articles that persuade and inspire. Read & enjoy!